These cool-growing orchids are found mainly in temperate regions of Mexico and South America and are therefore well suited to Melbourne’s climate. Many grow in mountainous areas and are tolerant of low temperatures, thus growing and flowering under similar conditions to those enjoyed by many cymbidiums. Some species are semi-deciduous, dropping their leaves prior to the onset of new growth and flowering in spring. This behaviour is their response to a distinct cool, dry season in their natural habitat, a period corresponding to the winter season in Melbourne. By contrast our winters are wet and therefore protection from rain and a reduction in watering during winter is essential to simulate the lycaste’s natural growth cycle. 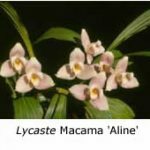 Those lycaste species from warmer, less mountainous regions grow more or less continuously throughout the year and flowering occurs mainly in late summer or autumn. These lycastes need additional protection and some warmth during winter, being cool (rather than cold) growers. However most lycaste hybrids, being bred from both cool- and cold-growing species, tend to do well in Melbourne with minimal protection during winter. Lycaste Species. 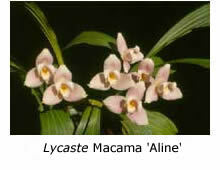 There are about forty lycaste species, of which a number are hardy and fairly readily available. Lycaste aromatica is a strong grower with nice yellow flowers and a sweet perfume; it flowers in mid to late summer. Lycaste deppei also flowers at this time and produces larger green-brown flowers, also with a slight perfume. Lycaste cruenta loses its leaves over winter and produces its lovely yellow green flowers in spring. Lycaste skinneri (previously L. virginalis) has flowers that are usually light to dark pink, although there are also glistening white forms. It flowers in winter or spring on mature growths and has been used extensively in hybridising. Lycaste macrophylla is another species well worth growing for its attractive coppery brown flowers. Lycaste Hybrids. The range of hybrids isn’t extensive and many are hard to acquire. However, a number of named varieties are among the most beautiful of all orchids, so keep a lookout for them on the sales bench and in nursery catalogues. 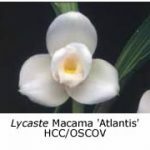 Lycaste Koolena and its offspring L. Macama include some excellent varieties, including L. Macama ‘Aline’, a blush pink, and L. Macama ‘Atlantis’, a shapely white. These hybrids are excellent growers and produce flowers of good shape. Lycaste Shoalhaven (L. Koolena x L. skinneri) also produces fine hybrids. I have a clone, made using L. skinneri ‘alba’, that has large, shapely, white flowers. Other hybrids of note are L. Karina, L. Cooma, L. Kiama and L. Wyld Court. Cultural Requirements. Lycastes grow satisfactorily in a shade house but protection from rain and cold winds in winter is important. While they enjoy good light and air movement, their large leaves are prone to sunburn and they should receive the protection of 70% shadecloth in summer, although the extent of shading should be reduced in winter. Most hybrids seem tolerant of large temperature differentials and strong light, although they produce their best flowers during the cooler part of spring. The tendency for their sepals to furl is most apparent in warm or hot weather. Lycastes need to be kept well watered in summer and generally drier in winter. They appreciate high humidity during the growing period and appreciate overhead watering at this time. Some growers don’t like to wet the leaves but I find little harm is done if there is good air movement and the wet leaves are not exposed to direct sunlight. Aquasol®, Thrive® and other liquid fertilisers, applied at half the manufacturer’s recommended strength, soon produce super-sized leaves and bulbs. Leaf size is one of the drawbacks to growing lycastes, as mature plants take up a lot of bench space. I grow my plants on low shelves close to the shadecloth walls, where they receive good air movement yet do not overshade other plants. Potting is an important aspect for success with lycastes. They are more sensitive to the frequency and time of potting than are cymbidiums and need to have new, active growths at potting time, otherwise the root system may languish. Lycastes should be repotted regularly, as they soon show signs of decline in a sour compost. I have found that a deep pot is preferred, possibly because it keeps the roots cooler during summer. They also require a free-draining mix with regular fertilising. I use a mix comprising 80% medium-size pine bark, 10% river pebbles/coarse gravel and some shredded oak leaves and/or peanut shells (10%). Some growers also include charcoal. A small amount of Osmocote® or Dynamic Lifter® may be added to the mix, and a layer of polystyrene chunks in the bottom of the pot improves overall drainage. 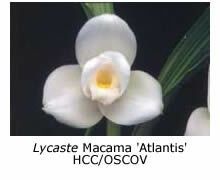 Overall, lycastes are rewarding orchids and are suitable for novices as well as experienced growers. Try to acquire a range of species as well as hybrids to add interest and to extend the flowering period.